Put dinner on the table before the kids' favorite TV show is over! Every stage of having kids has its perks and hardships. The first two years are a foggy, blissful blur of long nights, squishy snuggles, diaper changes and never leaving the house. Then life turns into an exciting tornado of blossoming personalities, potty training and lots of chasing (lots and lots of chasing). Once they become school age, there's a sigh and a feeling that you've really found the “sweet spot” of motherhood. Or so you think. After only a few years, the homework starts coming home, the playdates start, and the after-school activities start filling your calendar (and you can't just pick only one because they like everything and you can't deprive them from discovering what their Olympic-level talent is!). Then, they start driving, dating and before you know it they're leaving for college! I'm currently in the after-school activity whirlwind. My 7-year-old is athletic and fast with the energy of a chipmunk on Starbucks, so he's into soccer, basketball and tennis. My 9-year-old just made the competitive gymnastics team so she's now training six hours a week, and plays tennis. They both also have more of a social life than I ever will. Needless to say, dinnertime is a challenge! Violet gets home from the gym at 7 p.m., so if it's not fast, we're going to bed too late. I try to keep a few fast dinner ideas on rotation, and these two have been favorites lately. They're so easy to switch out ingredients, depending on what I find in the pantry and refrigerator. They also have enough ingredient options that everyone in my family can find enough of the things they like to fill them up (no beans for my kids' burrito bowls, and no onions on my husband's sheet pan dinner plate). Both recipes also include minimal dishes afterward, which allows this mom more time to snuggle these quickly growing kids to bed, because—as busy as life feels now—one day I'll have all the time in the world to make dinner, and I'll miss these days! Preheat oven to 400 degrees. In small bowl, whisk all seasonings into the olive oil. Arrange the meats and veggies on the pan, then drizzle with the seasoned oil. Toss lightly to coat. Roast at 400 degrees for 30 minutes, tossing ingredients once, halfway through roasting. Substitute or add any of your favorite veggies or meats! Brown ground beef over medium heat, stirring occasionally, adding the seasonings and cornstarch just as it begins to brown. 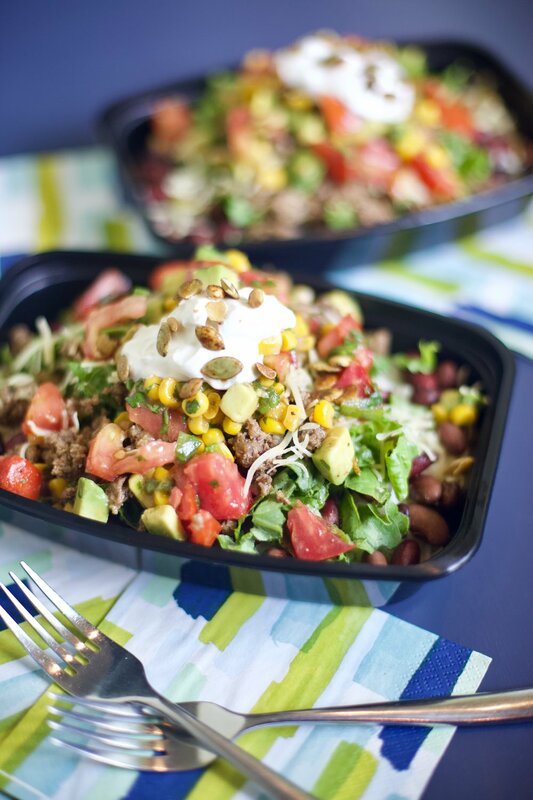 While beef is cooking, combine tomato, avocado, green onion, cilantro, corn and lime juice in small bowl. Toss to combine with a pinch of salt and pepper. Microwave rice for 90 seconds (you can heat in the bags, but I remove the rice from the bags and heat in a microwavable covered dish because I don't like microwaving plastic). To assemble, spoon some rice into the bottom of a bowl. Then a layer of beans, followed by the meat, a layer of cheese, the lettuce, and then spoon on the tomato and corn mixture. Garnish with sour cream, salsa and spicy pumpkin seeds. Serve with or without tortilla chips on the side.